AFTER experiencing the magic of Hong Kong, make the most of your trip and go for a day or overnight tour in Macau or Macao, formally known as Macao Special Administrative Region of the People’s Republic of China. Just a ferry or bus ride away from Hong Kong, this famous Asian destination is home to flashy casinos, gastronomic delights, culture, and historical remnants of its colonial past. From Marco Polo Hong Kong, where we stayed for the last two nights of our five-day trip, we walked for about 10 minutes to China Ferry Terminal at 33 Canton Road, Tsim Sha Tsui, Kowloon. We left Hong Kong around 9:15 a.m. and arrived in Taipa Ferry Terminal in Macao an hour after. After some immigration checks, we immediately looked for a free hotel shuttle provided by hotels to get to the city center. Yes, it’s free and that is the best part. But there are other ways of getting around the city: taxi and/or bus, if you feel like spending for transportation. We picked the Venetian shuttle since we decided to do The Venetian Macao first. 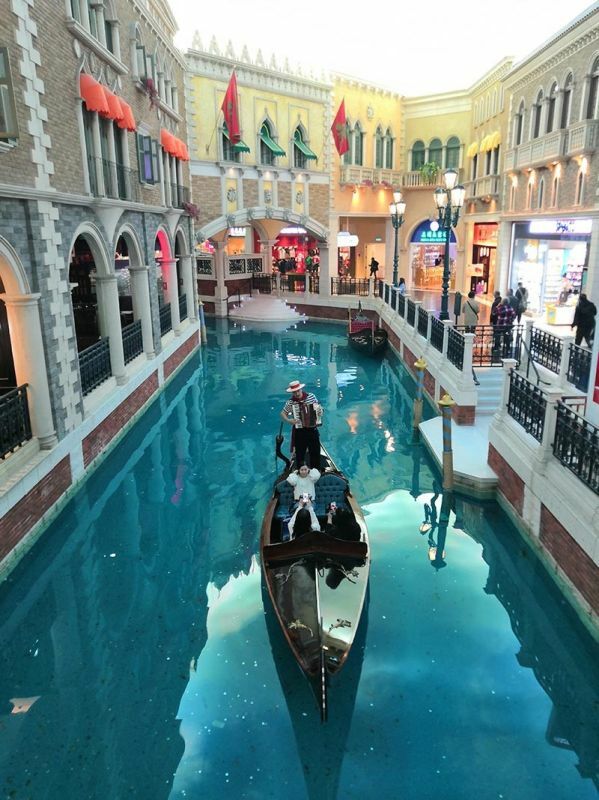 The Venice-themed resort will give you answers of why Macao is called the Vegas of Asia and we think there is no better way of starting the journey here than that. Considered as the biggest casino in the world, this place is sure paradise for gamblers, but there is more to The Venetian Macao than that. We skipped the casino part, actually, and went around this huge building occupied with several luxury shops, walking in awe brought by its impressive interior. But the real attraction here, for most travelers, is its network of canals patrolled by gondolas manned by gondoliers serenading passengers with love songs or classical music while under the building’s painted sky that looks so real. From The Venetian Macao, you can transfer directly to another resort that is the Parisian Macao. The two hotels are interconnected with an indoor bridge (Venetian Macao Hotel & Convention Center to The Parisian Macao 5th floor), just follow the signs or ask around and you will be into another destination in just 10-15 minutes. Seeing the Eiffel Tower without going to Paris, France is possible in Macao. I’m referring to its replica that stands exactly half of the original, of course. Some exciting activities here include the fantastic lights turning the tower into a colorful explosion of lights dancing from the base to the top. Visitors can also try to climb its observation deck. Or just go around within the replica and take snaps, just like what we did. After getting ourselves a taste of Paris, we proceeded to Senado Square via 26A bus. Thanks to the Overseas Filipino Worker (OFW) - also a Dabawenyo – working at the Parisian Macao as a resort staff who gave us directions on how to get to Senado Square and Ruins of St. Paul. We also met a group of Filipinos who were also on a trip. We found comfort with each other’s presence as we journey to an unfamiliar place. After some 30-minute ride, we arrived at Senado Square filled with tourists and locals. Walking around this main public square of the town that has a wave-patterned mosaic floor brought so much Western atmosphere. I must say the architectures of the surrounding buildings are nothing short of spectacular. The Square is considered a giant outdoor museum and a highlight of the extensive Historic Center of Macau, a Unesco World Heritage Site. Just a few meters away from Senado Square is the most famous landmark in Macao, the Ruins of St. Paul’s. This iconic towering facade and stairway are remains of the 16th-17th-century Jesuit church. It withstood the challenges brought by a strong typhoon and three fires. It was raining when we were at the site but it didn’t stop us from enjoying the view and taking pictures. Within the site are an array of stalls and stores selling the must-taste egg tarts, street food, and pasalubong items. Another landmark is Macau’s famous skyscraper, the Macau Tower. We just walked our way to the seaside area where one can view clearly the 338-meter-tall tower. We just took pictures and stared at the tower for a while and call it our day tour. The view of tower with the skyline and seascape is captivating and calming. But activities like visit to the tower’s 360-degree observation deck, Bungy Jump, Skyjump, and Skywalk can also be a choice for extreme adventure seekers. We went back to terminal by taking the bus just before sundown. Back in Hong Kong, after a short rest in our hotel, we headed to the A Symphony of Lights show which starts at 8:00 p.m. Hundreds of tourists await for this nightly spectacle of searchlights, lasers, LED screens and lighting dancing harmoniously to the beat of music transforming Hong Kong’s Victoria Harbour into an outdoor multimedia feast. After the 10-minute light show, we bid bye to or hungry stomachs and enjoyed a delicious dine at Café de Coral with Mama’s cousin – aunt Beth Lusica Mira. If there’s a lesson I had from this trip, it is travelling can be more meaningful and memorable if done with your favorite souls.